A new diet for the cows on a family farm in Pennsylvania yields better health for the cows and the land. 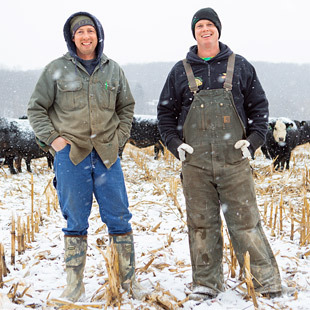 Who They Are: When Loren and Darren Elder took over their grandfather’s 150-acre farm in Pennsylvania 13 years ago, the cows they inherited spent only a few months of the year outdoors grazing on grass. From October to April, they were in the barn munching on hay and corn, a model the two brothers soon realized wasn’t financially sustainable. Yet they also knew the cows wouldn’t get the nutrients they needed if they left them in the field after the grass died. What They Did: Today, nearly 100 cows graze year-round on what is now a 500-acre farm, due to a new, more diverse menu plan. After the grass dies in the late fall, the cows move on to their next course: cornstalks left over from the harvest and the edible fronds of cool-weather crops like turnips and radishes. In addition to being more nutritious than grass, these crops allow the Elders to extend the grazing season by two or three months before they have to supplement with hay. They got the idea from New Zealand farmers, who often plant brassica cover crops to maximize grazing in the tiny country—but for the U.S., these brothers are ahead of the curve. Why It’s Cool: A longer grazing season means that even farmers in colder climates can more feasibly raise certified grass-fed beef (the definition of “grass-fed” includes forage too). For the Elders, it means healthier cows and up to $150 savings for each day they don’t have to feed hay. It’s also good land stewardship. When the cows graze on the radish and turnip tops and cornstalks, they tread manure into the earth with their hooves, fertilizing the fields that will grow next year’s crops. Loren and Darren Elder’s beef is available in high-end Pittsburgh restaurants and in farmers’ markets in the Western Pennsylvania region. Learn more at burnsangus.com.